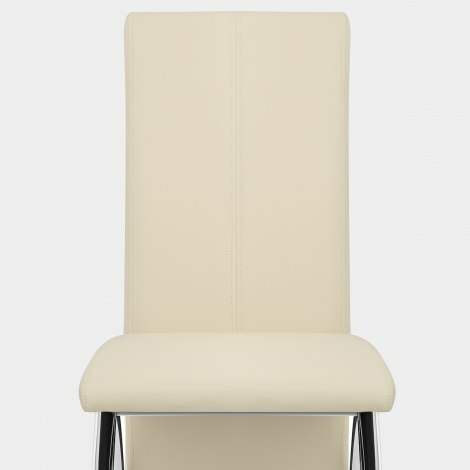 The Dali Dining Chair Cream is a chic item that never fails to turn heads, showcasing a modern design that will become a classic in your dining area. A cool and contemporary piece with elegant style, the Dali is a sure winner for your interior. The striking design leads your eyes to the high backrest, which extends in a graceful sweep from below the seat to support your back. This is padded like the entire seat, including the accommodating cushion, and is covered throughout in supple cream faux leather. With a dazzling profile, the seat is framed by pointed-arch legs plated in chrome. These keep the Dali superbly stable and have a shining allure. This gives the Dali an opulent touch, whilst at the base of the legs you can find rubber floor guards that help keep scuffs and scrapes at bay. "Simply love it!!!!! Better than expected!!!!" Truly stunning - I was a little apprehensive ordering due to how reasonably priced they were by comparison to others I had looked at, so half expected them to be of a lesser quality’. How wrong I was. Arrived within 24hrs of placing order, great quality easy to assemble and look superb - highly delighted. Would highly recommend. Thank you. I love the chairs. Perfect cream colour. look rich and very good quality. I am so pleased and happy with my purchased. Highly recommended 5*****. I am so pleased with the chairs I bought that I am ordering 6 more. They are a bit tricky to put together and it’s helpful for 2 people to do it. The quality is really good and the cream colour is perfect. Very sturdy, great quality and fantastic price. Quick delivery as well. Purchased a couple of these chairs and have to say they look great , nice padded chair with a good size seat and long backrest. From beginning of order to receiving the goods the whole process was brilliant, vendor sent emails advising me . Would highly recommend buying.